Hi everybody, im replacing the door fuzzies but i only have one on the inside panel and no one on the outside stainless.There is no holes after staples on the outside one.My question is, is this correct or am i missing something here? the kit that i bought has 4 strips that is correct length, but i have only one at each door. On a 2dr ht, only the inside gets the fuzzies. 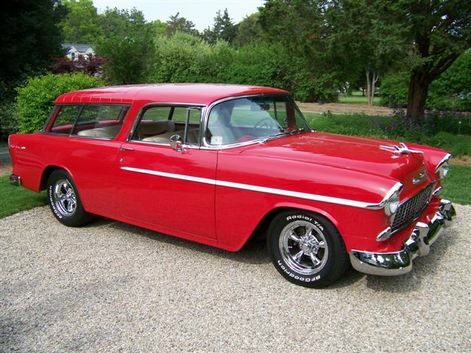 If you are talking about the horizontal window seals, the 55 Nomad does not have any. The chrome around the edge of the window glass would interfere with any seals as the window goes up and down. The guys are correct that the fuzzies are only on the inside, but when you look down in the doors with the windows rolled down it looks a little unfinished. We glued a thin fuzzy to each outer side when we had the car apart last winter and it looks a lot cleaner now. Jack is correct that the chrome window frame will come in contact with the outer fuzzy when the windows are rolled up and down, but there’s not much friction and mine are holding up just fine so far. Just something to consider if you want to finish out the outer pieces a little. My '57 has the staple holes on the inside door molding I think the original poster indicated. Not sure what year his car is, though. I glued a fuzzie strip to that inside edge and also replaced the little roller which attaches to the inner door sheetmetal there. The glass rolls up and down fine and the chrome surround doesn't catch on the fuzzie. I think the key is the roller. Do the '55's (or '56's) have that roller? Do these fins make my rear end look big? Nomad door fuzzies. My door rattles. It looks like there should be a fuzzie in the rear up/down channel but no indication there was ever one mounted there. It would be of a larger size due to the chrome window trim. (Original barn find) Any ideas? Edited by johnminton on 04-11-18 01:48 PM. Reason for edit: No reason given. The rear verticle channel doesn't have a formed fuzzy channel like the front, it just has felt glued in. "On the back side of the door is a wide channel to accommodate the chrome door window frame. We offer a felt to reline these channels. FS-92 is 1-5/8â wide and FS-92W is 2-5/8â wide. This felt is installed with contact cement on the back side of the felt liner and in the channel. Find a board that is the proper width and height to fit snugly in the channel. Wrap the pre-glued felt over the board and press into the channel. Let this set overnight to dry. Trim off the excess and remove the board. The channel is now ready for glass installation."